These beautiful heirloom radishes — volunteers from who-knows-where — popped up in my new yard early this spring! Are you guys ready? I AM!!! Oh my goodness, I am ready to garden. And with warm weather just barely around the corner, it’s time for all of us aspiring urban farmers to get outside and get our hands dirty. The best feeling! Okay, so truth be told, I’ve already been playing out in the dirt for a few weeks now. I have a whole new yard to work with this year, so I could hardly contain my excitement. My hardier seedlings were sown outside in late March — my broccoli and mustard greens, cilantro and red lettuce, and of course my very most precious medicinal herbs: chamomile and calendula and echinacea. But I know that California is pretty much an anomaly, and I’m lucky to be able to begin so early. And now, the rest of the country is gearing up for garden season! Huzzah! So I thought I’d share some of the gardening wisdom we’ve accumulated here on this site, over the years. Because man, I feel like we’ve done it all! From propagating strawberries into a proper patch, to saving our seeds (like sunflower and coriander and dill), and so many harvest projects in between. So are you guys as excited as I am?? In the past few weeks I’ve sown a fence border of sunflowers + snap peas + sweet corn. I’ve also started a few more seedlings outdoors, like basil and marigold and blue boys. And indoors I’ve managed to start a whole incredible collection of babies (despite two very curious kitties trying to thwart my plans), now ready to move outside: watermelon and loofah and tomatoes and bee balm and dill and peppers and pinto beans. Oh yeah! And purple cauliflower and fennel and onions and leeks. Whew! So what are you growing, my friends? What are your big beautiful plans for our upcoming gardening season? I’m *finally* renting a place with a yard that’s mine to do what I want with, as of like, a month ago (!!). I’ve already put in a shade garden in the front (full deep shade under some massive old pines) and planted hostas and ferns. I’ll be adding some Jacob’s ladder and horsetail eventually. The back and sides of the house are the opposite (full sun every day) so I’m planning a potted herb garden with the usual suspects – basil, rosemary, thyme, sage, mint, oregano – and then I have lots of seeds that need to get into the ground ASAP – sunflowers, 3 kinds of morning glories, tomatoes, peppers, beans. Then I hope to get started on what will eventually be a big hedge of lavender in like, 3 years. Gotta start somewhere! The place also came with an olllllld rosebush that’s seen better days but I’m hoping I can clean her up a little bit and enjoy some roses this summer! :D if I could garden all day, I’d be a happy camper. I just wanted to chime in and say that your blog might just be my favorite. I’m actually not vegan, but I strive to be compassionate and thoughtful in all my life choices, so I always appreciate your perspective on issues big and small, as well as your fearless truth-telling and authenticity. I’m also getting pumped for my urban garden this year (the boy and I have an urban garden plot) but we’re in finicky Chicago, so I’ll be excited to see your successes on the West Coast! This is so great you pulled the links from all over your blog into one place! I have to share this with my sisters, they’ll love it! Amazing that you have surprise radishes! It’s the season for being uplifted, and gardening plays a big part in that. 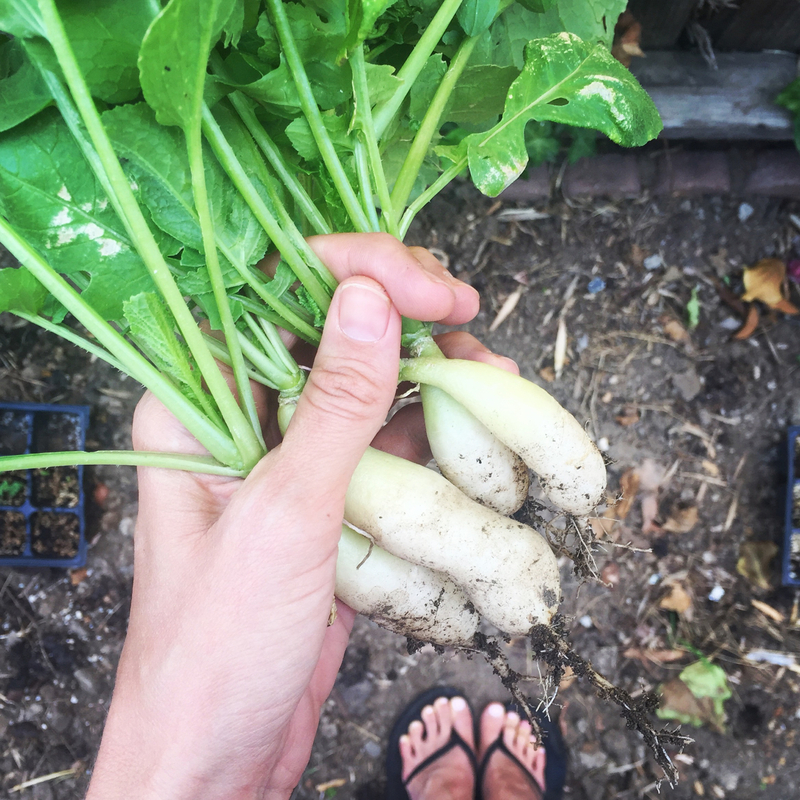 How fun and exciting that you have a whole new yard to experiment with (which has already rewarded you with those gorgeous little radish surprises–I would’ve been thrilled to find those!). Look forward to more photos. I have lots of plants in pots on the deck, including the usual assortment of herbs (we use tons of parsley and chives and basil and lemon thyme and rosemary). I have just bought Geraniums (love that Mediterranean feel on the deck), and have a giant French Lavender that has survived intense freezes for the past five years; that lavender is like a close friend/loved one. Veggies include collards, chard and spinach, onions, chiles (poblano, jalapeno). So the answer to your initial question is a resounding Yes! I am ready! And thanks for all the links. It’s so true, spring is totally uplifting. And yes, I’m so lucky! I have BIG plans for this yard, and it’s so fun to see what’s already here, as well. So far I’ve had volunteer radishes, tomatoes, mint, and even a potato plant in the back yard! There’s also pre-established native tobacco and epazote and stinging nettle, which is so exciting. Sounds like you are growing tons, too. I have just recently (like int he last few weeks) been really warming up to geraniums. I always thought they were boring, but suddenly I’m seeing them in bloom all over the city and realizing how pretty they are! Funny that you mentioned them — I just may have to get me some as well. I love what you wrote about your Lavender plant. I have a few plants like that! Like my potted miniature Meyer Lemon tree which used to live in my living room in Portland (too cold for citrus outside) and which I would cross pollinate by hand each year because, ya know, no pollinators inside! That tree is still going strong in a pot, now outside and loving life in SoCal. It was so fun to go back and read through them! And of course, this is just the “intro” type stuff. There’s so much more int he “Farm” section but it’s really specific so I didn’t include it. Maybe another list another time . . .
Aw, thank you Elle, I love hearing that! And you are not alone — the vast majority of my readers are not vegan. And I love that! 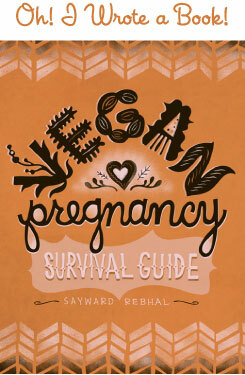 It means so much to me that I can create a space here where non-vegans feel dafe and un-judged. I think it’s so valuable! So thank you for being a part of that. When does the garden season in Chicago begin?? All I know about Chicago is EXTREME weather. I imagine that it goes from freeing cold to sweltering hot with very little in-between, but that may just be my imagination. How long is the growing season there? So at my last place I had a seriously scraggly old rose bush that was mostly dead when I moved in, and I managed to nurse it back to health and it was one of the most beautiful and productive roses I’ve ever seen! So I think you can do it. The key for me was cutting it waaaaaay back. It loved to be chopped down to almost nothing each year. Then it would come back fierce and fabulous. Man, I miss that rose bush! You’re right, it is SUPER extreme! This is the first year I’ve had a garden bed instead of containers, and I really struggled for a long time to find things that would happily produce both in a container and in the cold (read: almost frozen!) Spring AND in the sweltering summer! Last year I was harvesting kale in late May and putting the tomatoes to bed in late September– I probably could have done another round of cool weather crops in the fall but we were moving and it was just too much of a hassle. I love that gardening is all about learning, so hopefully I’ll perfect my methods a little more this year. Ah, thanks for the tip!! It’s actually looking pretty healthy now that we’re finally getting some sun and warmer weather, so I have high hopes. I am SO thrilled to have actual ground to work, it’s so therapeutic! Good luck with the first in-ground garden this year! I’m growing directly in-ground instead of in beds for the first time as well, and I am SUPER excited about it! It is literally my version of meditation. Like meditation and therapy all rolled into one. It’s the happiest place! Gosh, I wish I had your enthusiasm for gardening. Sadly, I really kind of hate it. :-( I do it every year because I do find it rewarding when things begin to sprout and bear fruit. But the planting, the weeding, the watering — all of that is no fun for me. My partner loves it, so he’s responsible for a lot of the work. But I wish I loved it more. We planted some hot peppers, and the strawberries I planted last season are making berries now (which is awesome!). I’ll be potting some herbs this weekend because I love cooking with fresh herbs. But gardening is just one of those things — like hot tea and bitter greens and licorice (ha!) — that I wished I loved but just don’t. This year we are starting smaller with some sun flowers and a little herb garden. Our sun flowers are already growing so strong!! I even saved some apple seeds from an apple we ate and tossed them into the ground…I mean, you never know right?? Oh and a pollinator garden hoping to bring more butterflies and bees back to our yard:) I can’t wait to see pictures of all your projects! I’m still trying to convince the hubs that growing cucumbers and tomatoes in the front yard isn’t a crazy proposition, but in the meantime, I’m making do with what space I already have. We started seeds inside in February and last month, put out 25 heirloom tomato plants (yes, 25), plus purple cauliflower, eggplant, and some cool little babies called “wonderberries” that we’re pretty stoked about. Once those were planted, we started seeds for melons, zucchini, and cucumbers… LOTS of cucumbers. Yum! I hope to plant those burgeoning beauties this weekend. I’ve also got spinach, lettuce, and herbs going like crazy in a raised bed. Charlotte has loved helping this year, which makes me really happy. At 3, she’s already showing immense interest in such things, and I hope she’ll be a little homesteader someday. We picked our first strawberries a few days ago, too. That was exciting! I think I’m most looking forward to the “muncher” cukes so I can make pickles using your fermentation recipe again. Last year’s were amazing! I just heard “Homegrown tomatoes” by Guy Clark (thanks, KEXP! ), and thought of you (save for the mentions of bacon, of course! ).